Don't be overwhelmed...I have an easy solution. I created the Busy Mom Family Budget pack as a simple, yet effective way, to track income and monthly bills, create a budget that works, and pay down the debt that you've been buried under. This is the same system I use to this day to manage my finances while taking care of my crazy busy, always on-the-go family. You're busy...trust me, I get it. There's just too many things to do and not enough time to do them. Often this leads to important tasks slipping through the cracks, like managing the finances. It's not that you don't care, it's just that there was no time organize everything, leaving you to rely on your brain to remember due dates. And what you consider optional tasks like budgeting? Pft...who has time for that?! Like I said...I get it. You don't need fancy software or a binder filled with dozens of pages to take control of your finances. While both of those methods have your best intentions at heart, often you end up needing more time to figure out the "fanciness" instead of just jumping in and getting straight to the point. This is where you get in trouble. Ditching the system mid-month because it's too complicated leads you right back down a slippery slope of overwhelm, missed bill payments, and busted budgets. ​The Busy Mom Family Budget Pack is here to help! ​What exactly is The Busy Mom Family Budget Pack? 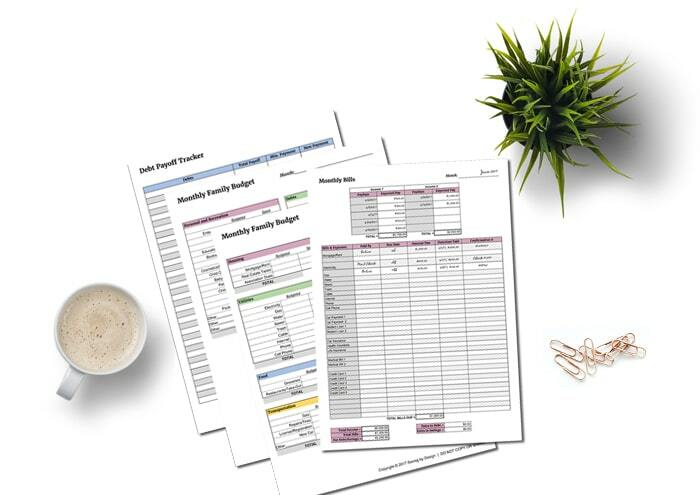 The Busy Mom Family Budget Pack is everything you need to track income and monthly bills, create a budget that works, and pay down the debt that you've been buried under. It's simple and to the point in one pretty little package! Not having a plan leads to chaos. Without a plan there is no order or system to our actions which leads to tasks always being on our minds since nothing is definitively taken care of. We never get to place that check mark by a completed task and move on. It's always just floating around which can be exhausting. This used to be the case with our finances. I was flying by the seat of my pants, trying to keep track of due dates and payment amounts in my head, instead of taking the time to create a consistent system that worked. Don't get me wrong...There was no shortage of software or planners out there, but they all just were more than I was looking for. They all seemed to have too many bells and whistles which made the already unpleasant task of dealing with my finances even more overwhelming. Whether you have gone completely paper free, or are an old-school paper and pen type of gal (or, maybe a little of both) the Busy Mom Family Budget Pack will work for you! 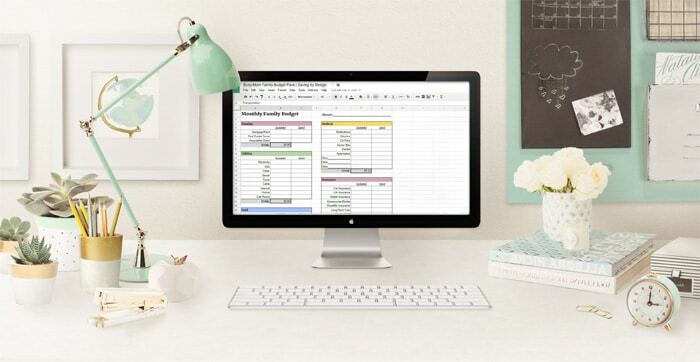 Your purchase includes both digital and printable versions of each worksheet so you can get your finances in order the way that makes the most sense to you. Print some of the worksheets and use others digitally...or even pre-fill some fields, print, and then hand write other fields (like I do). There is absolutely no right or wrong way to use the Busy Mom Family Budget Pack. "I am loving the BMFBP! This is the first time I actually feel I am on top of my finances. The stress of everything has been lifted I know where my money is going and I am actually able to save and still put down more money one my debt then just the minimum payment! So happy that I’m on my way to being debt free!" ~ Mary Ann K.
owns a home, has a job, and is ready to plan for their future." ~ Alexis S.
"I am a mom of 2 boys and also work full time. Things can get hectic sometimes. When it comes to paying the bills, I kept everything it notebooks. The BMFBP is so much easier to keep track of what needs to be paid." ~ Suzanne S.
but are currently not in control of their finances." ~ Hollie M.
Access to the exact (simple) system I've used for years to track monthly bills, maintain a budget, and pay down debt. 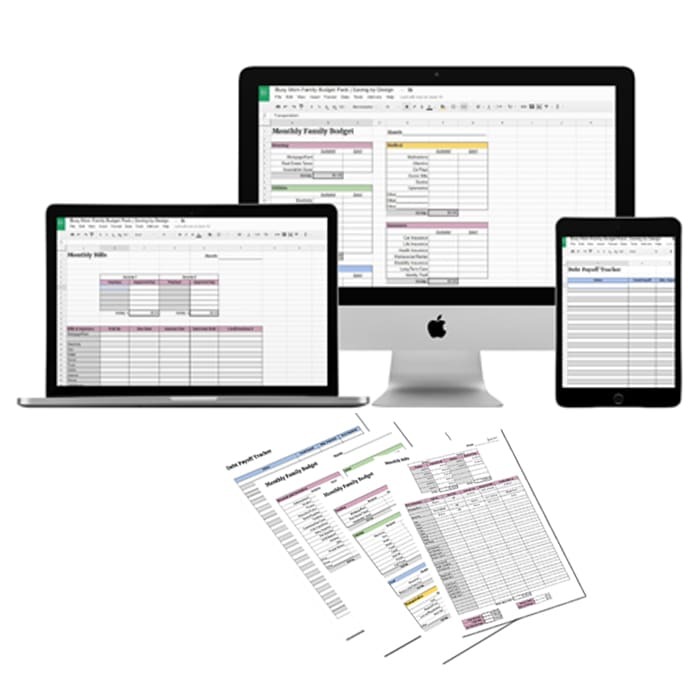 Both an editable Google Sheets file AND printable version to track your income and expenses the way that best makes sense to you. Fully formulated digital spreadsheets that will automatically calculate income totals, bill payment totals, and budget totals...you won't even need a calculator! 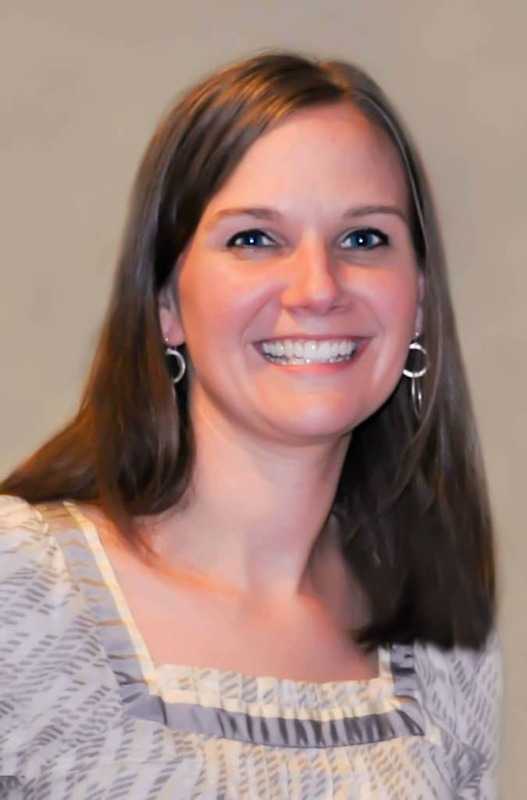 Hi, I’m Kara, the creator of SavingByDesign.com where I write about what moms care most about. I’ll help you create a life you love on a budget by sharing easy ways to save money, frugal family fun, and inexpensive DIY projects, in addition to my favorite ways you can earn money from home. I’ve found that so many moms struggle with fulfilling all their family’s needs and having the life they truly want without spending a fortune. That’s why I’ve made it my mission to share the many ways to save on everyday necessities along with those extras that make life fun like vacations and parties. Like many moms, I wear quite a few hats. I’m a biologist turned blogger, frugal living expert, lover of a great DIY project, and most importantly…a wife to a loving husband and a mother to our three wonderful (but sometimes rebellious) children.